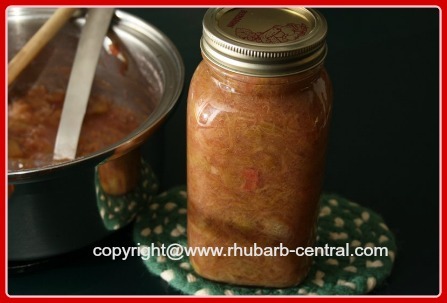 This Recipe for Canning Rhubarb provides step-by-step directions and all the information you need to preserve your rhubarb. 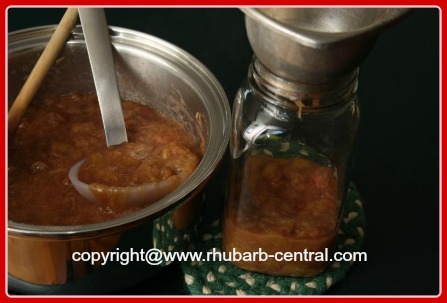 In addition to freezing rhubarb, and dehydrating rhubarb, this method of (canning) preserving rhubarb is yet another way to store this very versatile vegetable. 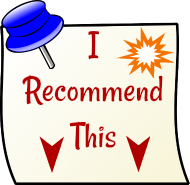 Scroll further down this page for rhubarb recipes for conserves/preserves, including a recipe for pickled rhubarb! This process does takes a little effort and time, but it is VERY worthwhile! 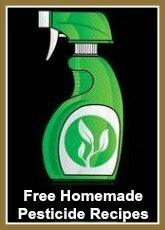 Choose stalks that are firm, crisp, and blemish free. 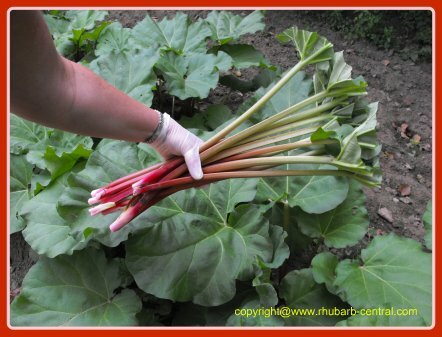 If you are planning to preserve the rhubarb immediately after harvesting it, remove the whole leaf, if you are not going to can the rhubarb the same day, then leave about 2 - 3 inches of leaf on (to help keep the moisture in the stalk so it will stay fresh and crisp longer). 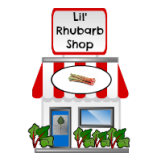 It is preferable to can your rhubarb the day you harvest it, however, if you cannot can the rhubarb the same day you harvest it, keep it in the refrigerator for up to 3 days, wrapped tightly in a plastic bag. 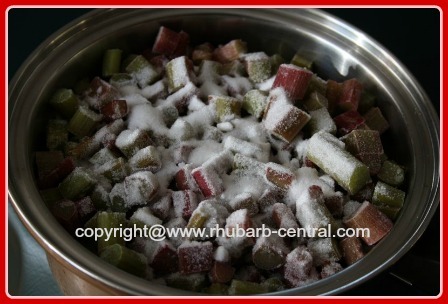 In fact, if desired, you can also freeze your rhubarb and can it at a later date, following these same instructions, using the rhubarb in it's frozen state. 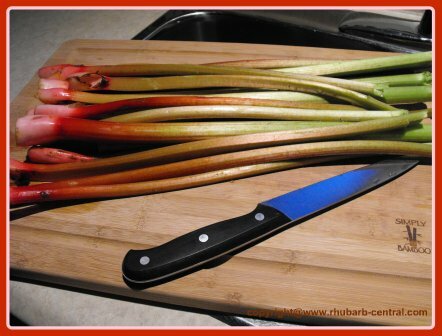 Using a cutting board, chop the rhubarb stalk into approximately 1 inch pieces. 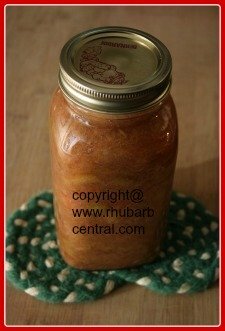 I find you need about 2 pounds (32 ounces) of chopped rhubarb to make a 1 litre jar of rhubarb. Wash the rhubarb with water and place in a non-reactive pan. Pack cooked rhubarb into jars, leaving 1/2 head space. Label and store in a dry place. Use your preserved rhubarb for a delectable topping on ice cream (my daughter's favourite), yogurt, waffles, pancakes, cheesecake or pudding. Or, use the rhubarb (this is what I use it for all winter long) as a side dish to ANY type of dinner. Or, make a scrumptious smoothie or yogurt parfait. Lots of possibilities! If the consistency of your canned rhubarb is not thick enough for your liking, you can thicken it (and make it a crimson red(! ).